An interesting little book about an interesting relationship. 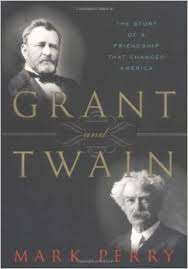 Grant, the hard-bitten Union general and Twain, the humorous Confederate deserter who ensured the former president did not die in penury. 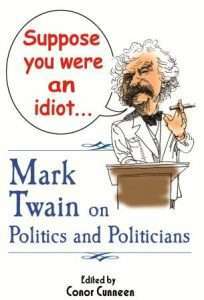 Twain (Samuel Clemens) published Grant’s memoirs and paid record royalties to the general’s family after he passes away from throat cancer. The book tends to be more of a mini-biography of the last years of Grant’s life and his dreadful suffering with the throat cancer that killed him. 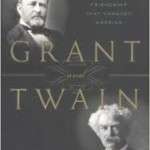 Grant’s persona takes up much more of the book than Clemens who although incredibly witty and helpful to many, did not suffer fools gladly and rarely forgot a slight. The world does owe Clemens a debt of gratitude for publishing Grant’s memoirs because they are truly interesting and very well written. 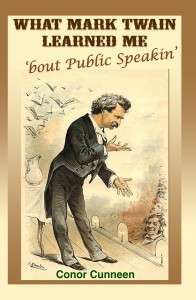 Author Perry highlights some really tenuous connections between Grant and Mark Twain’s characters e.g. the remarkable similarities between Huckleberry Finn’s descent of the Mississippi to free the slave Jim and Grant’s descent of the same river to free Vicksburg. Indeed his suggestion that Huck Finn might be an alter ego for Grant borders on the – well, not very sensible. The abiding memories from the book are the horrible painful death that throat cancer brought to Grant, how so many of Grant’s former West Point friends became Confederate enemies and the wonderful gesture of Grant’s wife who requested two of those Confederate generals to be pall bearers. It is nuggets like that which make this such an enjoyable read. It is well written with excellent source notes and bibliography. Book review written by Conor Cunneen who is a Chicago based keynote speaker, Emcee / Master of Ceremonies, motivational humorist and business humorist. * Award winning humorous keynote speaker etc. The fact is this type of consistent reference to humorous keynote business speaker – foodservice, pharma, cancer etc. (oh, give over Conor) helps you – through search engine queries – find this Irishman who can regale your conferences and events with a true Gift of GAB and very thought-provoking material. You can contact humorous keynote speaker and Chicago based Irishman Conor Cunneen at 630 718 1643. He will be delighted to provide you with additional reasons why he can justify all the ramblings about being a humorous keynote speaker – business, pharma, foodservice etc.